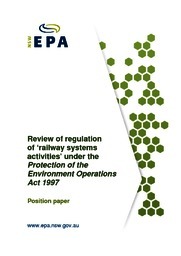 The EPA has reviewed the regulation of ‘railway systems activities’ under the Protection of the Environment Operations Act 1997 (POEO Act). The objective of this review was to determine the most effective framework for regulating the impacts of rail construction and operational rail activities on the NSW environment and community. The review identified that the current regulatory framework has not achieved the level of benefits for the environment and the community that had been intended. As a result, the EPA is proposing changes to the regulatory framework. The EPA developed a preliminary proposal to amend the existing regulatory framework and outlined this proposal in a position paper published on 3 September 2014. All interested stakeholders were invited to comment on the proposal. The period for submissions on the position paper ran from 3 September to 8 October 2014. The EPA received 46 submissions on the position paper from a range of stakeholders. The EPA has reviewed the submissions on the position paper (PDf 225KB), carefully considered the issues raised and refined the proposed alternative regulatory framework where necessary in response. The submissions report (PDF 114KB) outlines EPA's response to issues raised by stakeholders. The EPA is proposing amendments to ‘railway systems activities’ under the POEO Act to implement the preferred alternative regulatory framework. The public exhibition period for the draft Protection of the Environment Operations Legislation Amendment (Scheduled Activities) Regulation 2016 has now ended. The Environment Protection Authority (EPA) is reviewing the submissions received on the draft Protection of the Environment Operations Legislation Amendment (Scheduled Activities) Regulation 2016 (Amendment Regulation) and will consider them in the next stage of the amendment process.